This Operating system is purely designed from Genuine 32-Bit Vista Home Premium by Benjamin (Rockers International Team) and its dedicated for Home users, Video rippers, Audio rippers and for other entertainment purposes. Do everything in a single click. Go where ever in the windows at the right click. In normal Vista Home Premium Dreamscenes are not available but enjoy Royal Home Premium with fully activated Dreamscene packs. It will be more comfortable, faster and reliable when compared to other 32-Bit vista Home Premium operating systems. New hot fixes, updates and the Vista SP1 package are integrated. The Dolby digital plugins are also integrated for more fun with musics. New Codings for the system files, New windows sounds, New Gadgets, New Login screen, New Default theme, new Icons, New Buttons, New Sample Musics, Registry Tweaks and more….Having problems while Video Rendereing?.Those errors are fixed in this royal Home Premium. 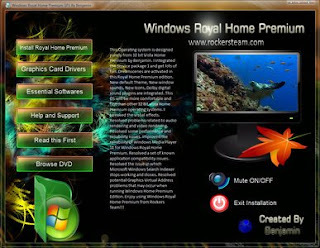 Just install this Royal Home Premium and start your work. System files are boosted upto maximum performance. Removed Vista Loaders. Note: DONT SALE THIS EDITION IN ANY ONLINE PURCHASING WEBSITES. WE ARE JUST MAKING THE WINDOWS SUITABLE FOR ALL USERS. THIS IS NOT FOR COMMERCIAL PURPOSE. IF ANYONE SELLING THIS EDITION IN ANY FORM, ROCKERS TEAM IS NOT RESPONSIBLE. - Don't modify this Royal Home Premium in anyway and for torrent uploaders dont add any viruses. - ALL THE FILES WHICH IS CREATED BY THE ROCKERS TEAM WAS DIGITALLY SIGNED SO DONT TRY TO MODIFY OR EXTRACT THE FILES. IF SO, THE SETUP WILL BE CORRUPTED AND LEADS YOUR SYSTEM TO CRITICAL SITUATION THEN ROCKERS TEAM WILL NOT BE RESPONSIBLE FOR THAT.